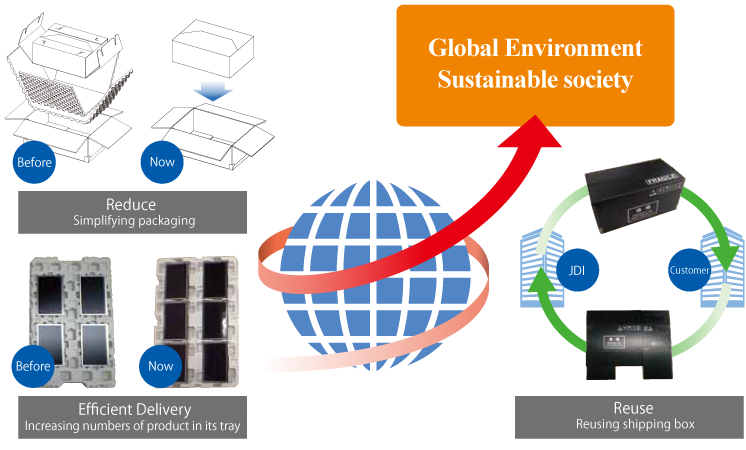 CSR : Environment : Environmentally Considered Products｜Japan Display Inc.
We consider the environmental impact of our products through Life-cycle assessment, therefore each of the eight assessment items of our products is graded at the development stage. Products that accumulate sufficiently high grades are honored with "Eco-product". We have worked to reduce the inclusive environmental impact of our products. We will continue to hand over only one earth to our descendants. Does it reduce size and weight? Dose it reduce any loss in production? Does it extend period to work? Does it prepare to recycle? Does it ease to disassemble? Does it reduce chemical substances polluted to the environment? Does it save energy to work? Is there any framework to disclose information with it? 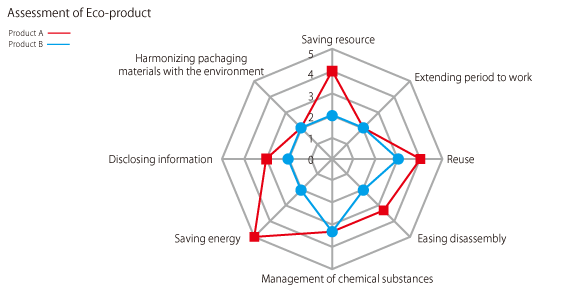 reuse and manage chemical substances with packaging materials? We improve efﬁcient delivery of our products to our customers to prevent the global warming. And we repeatedly reuse shipping boxes for our products. Furthermore we simplify packaging to reduce waste. Working together with our customers, we continue to conserve the global environment and contribute the sustainable society. The JDI Group works as one to manage the chemical substances contained in its products so that it conforms to legal regulations such as the RoHS Directive and REACH Regulations and is responsive to its customers' demands. We enacted our Green Procurement Guidelines to reflect both legal restrictions in various countries on the chemicals contained in products, as well as our customers' demands. We ask our suppliers to comply with the guidelines. The Green Procurement Guidelines are reviewed annually and are disclosed on our website. To avoid product environmental accidents, in the latest version 7.0 of our "Green Procurement Guideline" revised on April 1, 2018, we have been requesting to our suppliers to submit their analytical reports on all the resin materials (other than glass, metals and ceramics), constituting the components for each homogeneous material, because of "Phthalate esters" （DEHP, BBP, DBP and DIBP) regulated by European RoHS. We continuously comply with laws and regulations and make every effort to control chemical substances contained in products. We ask our suppliers to establish a management system for the chemical substances contained in raw materials and other procured items that follows the Guidelines for the Management of Chemical Substances in Products set by the Joint Article Management Promotion-consortium (JAMP). Using the system that links suppliers with JDI (jDesc Survey Site), we confirm whether a management system has been established. Suppliers that do not meet JDI's standards are asked to correct and improve their management systems. We establish the Green Procurement Guideline based not only on the RoHS Directive and the REACH Regulation in the European Union as well as other laws and regulations, but also on requests of our customers. Cooperating together with our suppliers, we manage chemical substances contained in procured items such as parts and material, related to our products. Before shipping them for our customers, we examine chemical substances contained in our products. Therefore, we minimize risks which could result in environmental pollution and destruction of ecosystem. Since April 1, 2013, we have been operating a system (jDesc*1) that links us with suppliers and helps us to manage the chemical content of products. Under this system, suppliers register their responses to questions about the materials used in procured products. Based on the responses from suppliers and information on the composition of JDI's products, we are able to confirm the absence in our products of chemical substances that might have a profound impact on the environment. By specifying the chemical substances included in our products and tallying up the amounts of each one, we minimize the environmental risk posed by those substances. JDI will continue to closely manage the chemical substances contained in its products.